What others are saying about TacView! Sergeant Ryan Mulholland - Commander, Special Response Team - Sheridan County Sheriff’s Office. Two weeks after receiving the TacView camera we (SWAT) were called out on a possible barricaded female with shots fired and one man down. This was in an 8-story casino hotel with up to 5 different locations on the shooter. Without any real practice, we used the camera to look from adjacent rooms into windows of rooms possibly containing the suspect in a 7th floor hotel room window from the above 8th floor room. We also used the small scope to look under the door for movement. The system worked fantastically and paid for itself on the first callout. Worked right out of the box and is "cop proof." My unit purchased one of your TacView 2600 units to use as an attic entry tool. This piece of equipment has surpassed our expectations and is one of the most valuable tools in our tactical entry equipment inventory. On countless occasions we have been able to insert the unit into a darkened attic enabling us to view a suspect who incorrectly believed that he was adequately hidden. For years I have always dreaded sticking my head into a darkened attic. Now, with the use of your equipment, those days are gone. I can't say enough about the TacView system. We use it routinely. Thank you. Thank you for the awesome product. We have used it on many SWAT call-outs and warrants, and this tool has been invaluable. We have searched attics, hideaways, and barricaded rooms with great success, leading to the safe apprehension of suspects. On a recent large-scale warrant involving the Secret Service and DEA the durability of the TacView Polecam was tested. The protective lens on the LCD Screen was damaged during the raid, but the screen was protected and we were still able to utilize it on the call. George’s customer service has been great and his product has worked well for my team for the past 7 years. On behalf of the Cornwall Community Police Service, THANK YOU! The unit, bag, gear and attachments are way beyond what we expected. It is an amazing unit, and all the CERT members greatly appreciate it. Thank you again. 340 rue Pitt St. C.P./P.O. It was great talking with you today. Our team purchased a TacView pole camera in 2004. We have definitely used and in some cases probably abused the system. Regardless of how many windows we have put it through or how many times it has been dropped and trampled we have never had to do more than replace the batteries. Thank you for building a pole camera that is truly capable of keeping up with the demands of a tactical team. I have used other systems and none of them have been able to measure up. If it ever fails us I’ll contact you immediately to order a replacement. George and staff: I really appreciate what you do! You are using your knowledge to create a piece of equipment that helps save law enforcement lives. I personally, and on many occasions, have seen this piece of equipment in action and during SWAT missions. It is a great tool and has saved my team members from injury on several occasions. Additionally its functionality has helped capture many "bad guys". Keep up the great work! We used the cam last month on a barricade that lasted several hours, with the suspect moving up into a common crawlspace attic for several apartments. We were able to locate him with the TacView camera and then take him into custody. One thing that was useful for us was taping a high power flashlight to the top of the camera head. It works without it, but we wanted to let him know that we could see him. The cam is one of our most useful pieces of equipment. Thanks again for your product. Thank you for making a very good piece of equipment that has paid for itself several times over. Since receiving this pole camera, it has been deployed with my team on multiple operations and has saved many officers from having to stick their head into an unknown area with armed persons on the other side. In January 2009 my unit purchased one of your TacView 2600 units to use as an attic entry tool. This piece of equipment has surpassed our expectations and is one of the most valuable tools in our tactical entry equipment inventory. On countless occasions we have been able to insert the unit into a darkened attic enabling us to view a suspect who incorrectly believed that he was adequately hidden. For years I have always dreaded sticking my head into a darkened attic. Now, with the use of your equipment, those days are gone. I can't say enough about the TacView system. We use it routinely. Thank you. Keep me updated on new products. We'd love to try them out. We have a very active fugitive unit. In the past 7 1/2 years we have cleared over 9,200 warrants! As you might guess we search a lot of houses. Your system is used frequently. I just hope we don't wear it out. The Tacview camera arrived today. First impressions? HOLY COW this thing is awesome. We’ve been playing with it non-stop. The IR works great. We were able to see our intern about 25 feet away in near total darkness. (It would have been farther, but we ran out of room.) The whole design is so simple and easy that it’s Deputy proof! I had it up and running in about 1 minute without having to look at the directions. It’s an outstanding product, and I can’t wait to show my Chief and hopefully get him to purchase a few more. Thanks again for your outstanding customer support. In Sept 2007 our patrol officers responded to the report of a shooting inside of a house. When officers arrived they could see an unconscious victim inside and saw a suspect run upstairs. Officers made entry to check on the victim but he was deceased. The suspect would not communicate with the officers. SWAT Officers took over the scene. The living room of the house had an open staircase with an overlooking balcony. We deployed our TacView to the edge of the balcony on the second floor and could see the suspect lying on the floor inside of a half open bedroom door with a handgun in his hand. The suspect was clearly pointing his gun on the top of the stairs, obviously lying in wait for any officer who may have ascended the stairway. Had any officer gone up those steps, the suspect would have easily had a shot on the officer before the officer could see the suspect. The suspect laid in that position for two and a half hours and the TacView was invaluable in keeping track of him. On the humorous side; when the unit was very new we deployed it into an attic hatch to look for three shooting suspects (no victims). As we slowly raised the unit into the attic and began to turn it, the suspects immediately surrendered. They stated they thought it was a robot that would hurt them. In May 2006, we purchased a TacView pole camera. The pole cam has been instrumental in the way that we do drug entry searches and slow and deliberate searches. We have been very happy with this piece of equipment and the customer service profided by your company. We have even used the Tacview to assist in searching storm drains for evidence on three or our latest homicides. I received the TacView about 20 minutes ago. Like any guy you ever met, I read the instructions after I played with the pole cam. Never the less, I wanted to thank you for the speed in which you sent the TacView, and the simplicity of design. I have seen other products like this that are difficult to assemble, difficult to use, or are way too easy to damage. The TacView is obviously very strong, is the hallmark of simplicity in tactical operations and is overall a pretty incredible product. Probably the best $3,000.00 I’ve spent for Tactical Operations in a very long time! Thanks for a great product! Two weeks after receiving the TacView camera we (SWAT) were called out on a possible barricaded female with shots fired and one man down. This was in an 8-story casino hotel with up to 5 different locations on the shooter. I (the Team Leader) had taken the camera home after receiving it and briefly played with it (minutes only). Without any real practice, we used the camera to look from adjacent rooms into windows of rooms possibly containing the suspect and also used it to look through a 7th floor hotel room window from the above 8th floor room. We also laid a shield across the doorway, laid behind it and used the small scope to look under the door for movement. The system worked fantastically and paid for itself on the first callout. Worked right out of the box and is cop proof - don't even need instructions. Hopefully, we can train with it a little before the next incident. Thank you George for the quick reply. It's a pleasure doing business with a company that still shows concern for customer service and satisfaction ... you don't find that often any more. Thanks for a great product. We trained with it in December and then got to use it in January. Some court officers went to serve an eviction. When they arrived, the suspect went into his bedroom, and a gun shot was heard. We (SWAT Team) responded and handled it as a barricade. 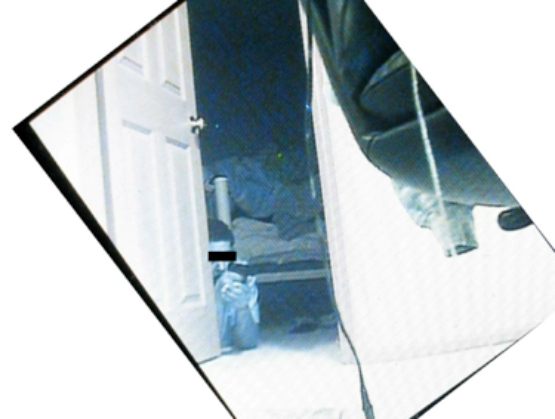 After getting a search warrant, we broke a window and introduced the camera into the bedroom. We could clearly see that the suspect had shot himself, and we were able to secure the house without jeopardizing our Officers. My team tested your camera on Monday, 02-04-08. All we can say is, "Wow!" We all were impressed. Please complete this vendor registration form, and attach the total price. Thanks for the Great Product. My name is Javier Garza, I am a police officer with the Gary Indiana Police Dept. Aside from my narcotic duties, and I am also assigned to the Gary P.D. SWAT Team. I have been a SWAT member for over 5 years. Last year our SWAT Team purchased 2 of your polecams. I am proud to say that you have a great product. Our SWAT team is one of the most active SWAT teams in the Midwest. Before we purchased your polecams, when it can time to search an attic, crawlspace or places we couldn't reach, we would put the smallest SWAT operator in a nontactical position by sticking his head up in those spots. Since we have had your polecams, we have the upper hand when it comes to searching the danger areas and not to mention, a tactical advantage. Using your pole cam we have located stolen bank robbery money in an attic during a search warrant for the FBI. We have located many armed and dangerous suspects trying to hide in an attic or crawlspace. Once, patrol officers had an active shooter flee into a residence and the patrol officers cleared the residence and couldn't locate him thinking he had escaped. I and other SWAT operators arrived and did a secondary search of the residence and using the pole cam, we checked the attic and located the suspect. Today, 09-11-2007, we assisted the Homicide unit in searching a residence for a multi homicide suspect. Swat secured the residence and we noticed an attic door. I utilized the pole cam and discovered a large lump and possibly a hand under the insulation. After several orders, the suspect showed himself and with the pole cam, I was able to see him come toward the attic door and surrender himself to us. I recommend your product to other SWAT teams. It is a life saver. Thank you for helping us stay safe. On Tuesday, 090407, we received information from a confidential informant detailing the location of a burglary suspect with outstanding felony warrants possessing a sawed-off shotgun and who would be hiding in the attic of a specific apartment. Our search team gained entry but did not locate the suspect initially. Evidence showed fresh entry into the attic. Using the TacView pole camera with a shield, we were able to search the attic without exposing ourselves to the suspect. We located the suspect on the south side of the attic hiding behind a chimney. Once he was located, the pole camera was kept on him. Negotiators were brought to the scene and the use of chemical agents was considered. However, negotiations were successful and the suspect eventually climbed out of the attic and was safely taken into custody. My name is Jason Burton, and I am a member of the entry team for the Tyler Police Department SWAT team. I just wanted to let you know what a great product your camera is. It worked flawlessly and made a big difference in our operation. It is a pretty unnerving thing going into a house searching for a person armed with a gun, but your camera allowed us to clear 90 percent of the house from the outside. Thanks for a great product. My name is Rodney Harrington; I am the perimeter team leader for the Tyler Texas S.W.A.T team. I just wanted take a moment to tell you thank you, and to let you know what I think about the camera system that we received from your company. I have looked at and trained with different pole camera systems, but I have to say that the simplistic design of your system makes it the best all around system that I have seen yet. This weekend, we had an opportunity to deploy with your camera system in a barricaded suspect call. The suspect was armed and had already confronted officers. Using the system, we were able to search the house without placing operators in direct line of fire from the suspect. To simply put it, this camera system has proven it’s self as an essential tool for the team. Rusty Jacks here in Tyler. I apologize for not writing sooner to thank you. We got the camera you sent. It is great!! We spent an entire training day using and getting familiar with it. This past Saturday, we had a call-out where we had a woman in a house armed with a handgun. It is a long story, but after trying gas, impact munitions, etc… we ended up porting every window of the house and used the camera and a shield to clear the rooms. We then did a stealth search of the house using the camera to clear rooms before entry. I can’t tell you how much it added to the safety of my officers to be able to see the layout of the room (and that no one was waiting to ambush them) before making entry. You make a great product at a price any department can afford. I think every police department, whether they have a SWAT unit or not, would benefit from having one of your cameras. We will definitely recommend it to everyone we get a chance to. I cannot express our appreciation for you outstanding customer support and the way you and your company stand behind your product. We have been using your product for a few years now and have deployed your camera on too many operations to count. I have no doubt that your product has enhanced our overall response capability and has proven to be very valuable to our team's mission. Just a message to say how impressed we are with the camera system. It does a great job and is easy to use. I am equally impressed with your commitment to customer satisfaction and to your affordable pricing. Last weekend, we had a subject barricaded in his house, who was wanted for attempted murder. The subject was armed with a handgun and after insertion of chemical agents, he secreted himself in the attic of the home. The subject fired several rounds from his revolver during the course of the call out. Two holes were ported in the attic. We used the TacView pole cam to observe the subjects movement in the attic. It was incredibly useful for the deployment of chemical agents and other munitions that were fired from the ports because we could time the shots when the subject was not near the teams. Periodically, we would loose sight of the subject, due to smoke or his movement, but we were always able to pick him up again quickly with your camera. I can not stress how comforting this was to have real time information on the subject and his activities without having to put an officer in danger. You make a great product. We use them all of the time. How many times? Our full time SWAT team served 407 search warrants and responded to 25 barricaded gunman incidents in 2006. I figure that we used the cameras at least 300 times to check attics and crawlspaces. We have two of these. If you want to see your product in action, we recently completed filming of the television show SWAT USA for Court TV. There were three times that they filmed us using your product. The show will air sometime this spring. And, if you are looking to demo your products, we are the host city for the National Tactical Officers Association Tactical Operations and Training Conference, in September, 2007. I am a police K9 officer in Beaumont, Texas. On June 04th, 2006, I stopped a 2003 BMW SUV for traffic offences. As the stop continued, I gained consent to search the vehicle. I noticed fresh body work under the vehicle near the rocker panels. As I removed the plastic molding of the vehicle, it exposed small holes, which with the help of the TACVIEW SCOPE, I was able to look inside the compartment and find 35 KILOS of cocaine. Another drug dealer behind bars due to your product. Thanks again for making such quality equipment. Scott Lisenby. Beaumont Police Dept. JUST A WORD TO KEEP YOU UPDATED. AUBURN, NY, EMERGENCY RESPONSE TEAM, USED THE TACVIEW POLE CAMERA WE PURCHASED ON A RECENT CALLOUT. THE TEAM WAS CALLED OUT TO HANDLE A BARRICADED GUNMAN (SHOTGUN). THE CAMERA WAS USED TO CLEAR SOME DANGER AREAS (FUNNELS) INSIDE THE GUNMAN'S DWELLING IN DARKNESS AND ALLOWED OUR TEAM TO MAKE A SAFE TACTICAL ENTRY. THE SUSPECT WAS PLACED INTO CUSTODY. NO INJURIES TO SUSPECT. NO INJURIES TO POLICE. . I would like to thank you for a well made product at an affordable price. I did research on all systems out there prior to making my decision on a pole camera. I felt that your product delivered what you said it would and is well made and thought out system. My team is very pleased with what the system can do. I am very pleased with how you stand behind your product. When a team member broke a camera head during training, all it took was a call to you and you had a new head shipped out that day. Customer service and turnaround time is outstanding. I do and will continue to recommend this product to other tactical teams out there. Again, thank you for all your help, support and affordable product. Just a word to let you know what's up. Our swat team has been using the TacView that you sent to us. We have recommended to the Chief that the TacView be purchased. The grant has been approved. We are just waiting for the money. Thanks again for the help. Aurburn Police Department, Aurburn, New York. I would first like to say thank you and express how very pleased our team and several others in the area have been with the TacView 1400. After I received the pole cam, I made arrangements to have one of my more technical savvy operators come to my office to hook up the system seeing that I have come to realize that I am a tech "wizard" and knew this thing would be a wire jungle. Sgt. Reid was running a bit late and I couldn't wait so I opened up the box and looked things over. I had the system up and running in less than a minute - that's when I realized just how smart I really am... OK how easy the system was to have up and running. The following morning we put the SWAT cam to use in a large scale Terrorist Take Over Training Scenario (based on Beslan). Our team and eight other SWAT teams participated and were very impressed with the camera's capabilities. We utilized the pole cam several times outside the school on our approach and inside the classrooms. On one occasion, the cam saved our team from triggering an IED simulator which had been placed in one of the classrooms. We were able to see into the room with the camera and spotted the device which would have been triggered upon entry and we would have lost most everyone. We also had a great time showing the SWAT cam to the other teams, and we decided that the TacView 1400 was going to be a very essential piece of equipment for our team. You made believers of us all at that training session, Thank you again George. I am a Sergeant with the tactical team of the New South Wales State Police in Sydney Australia. Last year I undertook a study tour of tactical teams across the USA and attended the NTOA Tac Ops Conference in Florida. During this time I saw the TacView Pole Camera at a number of different agencies and heard nothing but good stories about this product. The TacView has been very well received within the unit. Its first operational use was during a stake out for a robbery inside a club. A number of crooks were planning to enter the club in the early hours of the morning and raid an ATM. The boys were able to secrete themselves in a nearby room and watch the action remotely prior to the arrest. Certainly will change the way we approach some operations. We have been evaluating pole mounted search camera units for some time preparing to purchase one for our Tactical Operations Unit. After evaluating the 1400, we found that it not only meets our needs well, but we were also pleased with the high durability and functionality of the unit. I might also add that the cost of the 1400 and accessories is very economical and allowed for us to purchase an additional unit for our Patrol Division also. The Department of Public Safety, Sheriff's Division would like to thank you for sending one of your units for Test & Evaluation. Our employees were very happy with your product, and we will be purchasing approximately 3 units. I am on an E.R.T team in Indiana. Our team was called out on a Friday night to serve a Warrant in a residence. Using your camera system, along with a digital video recorder, the team was able to record the entire detail from the drop off point up until the suspect was loaded into the police cruiser covering the team from any false accusations that may have arisen. This was done by simply attaching the camera to a helmet and plugging the video recorder directly into the existing video plug built into your system enabling the officer to video tape the entire incident with both hands free. Great Product, Many, Many Uses. I received the TacView system that you sent. Thank you for your prompt attention. I like the unit very much! It is simple, direct, and it does what it says. I put it through a modified home test and was very pleased. f that the TacView be purchased. The grant has been approved. We are just waiting for the money. Thanks again for the help. On 8/22/04 the Kissimmee Police Department's Swat Team was activated. We had about 8 businesses in one building. It was believed a burglary suspect broke into one of the businesses and hid in the ceiling when the first officers arrived on scene. Some of the businesses had a separate entrance and rear door and there was an interior hallway that had access to the remaining businesses. Prior to having the pole cameras our swat operators would be forced to use mirrors which couldn't completely clear an attic space. Quick peeks would be the last option to finally clear that space. However, on this day we had the pole cameras. We used the camera to move ceiling tiles in each business to methodically clear the attic from one end to the other. This was all done at the ground level and no officer had to enter the attic space to complete a final check. The camera worked exactly as advertised and assisted in resolving the incident in half the time it would have normally taken. The pole camera was very versatile and proved itself in its first call out!! We used the pole camera the past few days and the team loves it. We are going to have a meeting next Wednesday to pitch it to the command staff. If it goes the way we want we would like to have more than one system. I will let you know the results. Monday, August 16, 2004...We tested the camera and found it to be outstanding...We are very excited to add this piece of equipment to our department. Thank you for your cooperation and assistance...I would highly recommend this camera to other departments. Our department purchased the TacView and it has been everything it was advertised to be and more. On the morning of June 18th, 2004, two Grand Prairie Police Officers responded to a Wal-Mart Store parking lot to investigate a suspicious van. Police received information that the van had been parked at the Wal-Mart store overnight with the engine running. As the two officers investigated the van, the lone male suspect inside the van began to fire through the van striking both officers. One of the officers returned fire into the van and both attempted to retreat. Additional officers responded and rescued the downed officers who were transported to local hospital where one of the officers died from his gunshot wounds. A standoff ensued where the gunman called his girlfriend and told her what had happened. The gunman further told his girlfriend that he had a bomb inside the van. Negotiators attempted to contact the gunman inside; however, no communication was received. During the standoff, SWAT delivered chemical agents into the van. Again, no response was received. Unsure if the suspect was deceased or if a bomb was present, the Mansfield SWAT Team, utilizing their armored SWAT truck with heavy-duty ballistic protection, moved the Grand Prairie SWAT Team approximately five feet from the suspect’s van. The Mansfield SWAT Team opened a small port in the armored truck and utilizing their TacView pole mounted camera, searched the interior of the van while remaining in the armored truck. Once the camera was placed inside the van, SWAT officers observed the lone suspect who appeared to be deceased. A further search of the van did not reveal any apparent explosive devises. While maintaining the camera on the suspect, Grand Prairie SWAT officers entered the van and confirmed that the suspect was deceased. The TacView pole mounted camera was instrumental in the safe and successful conclusion of a long, hot, and emotional stand off. The TacView allowed SWAT personnel to safely remain inside an armored vehicle while searching the interior of the suspect’s vehicle. 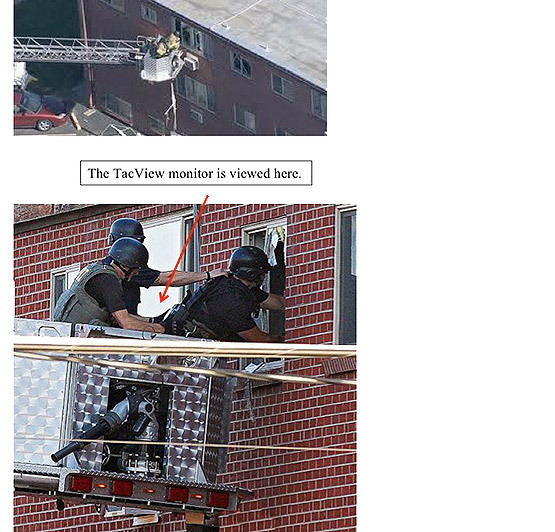 The Mansfield SWAT Team has owned a TacView pole mounted camera for over a year. Although utilizing the system in many training environments, this was the first actual operation where the system was used. The Conroe Police Department has the TacView camera and uses it on a regular basis in both training and in tactical situations. The Special Investigation Unit utilizes the camera during search warrants, undercover buys, and surveillance. One particular incident which proved to be the most cost saving and reduction of risk to personnel use of the camera to date involved a Methamphetamine lab search warrant in Waller County. Intelligence provided indicated a railroad tank car had been buried on the property and was being used as a lab to cook methamphetamine. During execution of the warrant the buried tank car was located. A visual check from the above ground entry hatch revealed one side of the tank was collapsing. We were unable to determine the existence a lab from the hatch because of its location at the end of the car and the unlit interior. Because of the tank car’s condition, personnel were not able to enter per Haz Mat and OSHA regulations. To determine the contents of the tank car, heavy equipment was requested to dig it up prior to inspection. I advised the on scene supervisor we had the TacView camera and was told to give it a try. With the assistance of one investigator, I was able to lower the pole camera fully extended and examine the entire length, width, and contents of the tank car. This took approximately ten minutes from start to finish with no damage to property or unnecessary exposure to personnel. The camera paid for itself tenfold in the time, effort, manpower, and equipment that would have been required to excavate the tank car. We continue to use the camera in tight dark spaces, such as crawl spaces under a house, dog houses, and attics, where we used to have to send a person with a flashlight. Use of the camera greatly minimizes the risk to our tactical team members and narcotics personnel because we no longer have to belly crawl under structures and fight snakes and critters on their level or pop our heads up through an attic entrance hoping a suspect is not waiting in the corner to harm anything exposing itself through the entry. I just wanted to drop you a quick note regarding your TacView Camera. The NIPAS EST Team has been keeping extremely busy this past year. This means your camera system has been getting a thorough workout. I have included an article from one of the local papers, which captured a photo of our team deploying the camera. Thanks again for all support during the last couple of years. "If you can see the barrel of the bad guy's weapon...his bullet can hit your eyeball." When officers are searching for a barricaded suspect or just checking an open door, we clear rooms and buildings, slice the pie, sometimes break and rake windows and even take a quick-peek or two in order to locate a suspect depending on how we were trained or what the situation requires. We do this by looking around the corner or through a window with our eyes or with a handheld mirror or pole-mounted mirror (providing there is light to illuminate our view). Even if our department has a huge budget with a fully equipped Tactical Team or SWAT team equipped with Kevlar helmets, our problem is that you have to still see the suspect. IMPORTANT NOTE: If your eyes can see the suspect’s barrel, then the suspect can shoot you in the face – am I wrong? I don’t think so. TacView wants to change that and do it within your agency’s budget. We want do it before another officer gets killed while looking into a window after a break and rake. (Beaumont, Texas) TacView has developed affordable technology. We and other agencies are currently using it. It has already saved one life. (We are now beginning to compile statistics and officer testimonials.) We are firmly convinced that it will save more lives. Try the TacView for 30 days with an unconditional money back guarantee. If you don’t like it for any reason, return it for a complete refund - we will even pay for the shipping both ways. After you receive your first TacView product, I think that you will say what the first officer said when he used it at the home of a barricaded 67 year old cancer patient who shot a patrol Lt. in the leg from a distance with bird shot. The inventor, George Gilmer, had just produced his first prototype. At the time, George was also a team member, training instructor and Sergeant with that same SWAT team just north of Houston, Texas. The Tactical Team Sgt. requested the TacView pole camera prototype and was able to position the TacView pole camera around the corner of the building, never exposing his own face while looking at the suspect on the monitor, talking to the suspect from behind cover and negotiating surrender. At the same time, the Sgt. was able to watch the suspect walk out of the doorway of the home toward the direction of the arrest team. Unfortunately, the suspect approached the arrest team with his hands behind his back. (Was this suicide by cop?) Well, using TacView, the Sgt. and the officers standing next to the Sgt. looking at the TacView monitor were the only people who could see the suspect’s hands which were behind the suspect’s back. The Sgt., using the TacView, was able to clearly see that the suspect’s hands were empty and was able to relay this information to the arrest team. If it were not for this view, the arrest team may have had a legitimate reason to believe that the suspect was still armed - Remember, the suspect had already shot an officer in the leg. At the end of the stand off and a successfully negotiated surrender, the Sgt. said enthusiastically, "George, we need ten of these!" Each member of the Team is issued a ballistic vest, a load bearing vest, Kevlar helmet, gas mask, elbow and knee pads, and tactical headset for radio communication. Most of this equipment, as well as other tactical equipment was recently purchased through grants, donations, fund raisers and contributions from the city. Donators include the 100 Club of Houston and many gracious citizens of Galveston. The ballistic vests, costing over $1200 each, were donated by the 100 Club of Houston. The 100 Club supports law enforcement agencies, their officers and their families in the Houston area. The Team was able to purchase a TacView pole camera, with donations from Galveston local, Dr. Marty Ivey. The pole camera allows Team members to view into rooms, around corners, and into danger areas without exposing themselves in the open. Since the purchase, the Team has used the camera in two call-ups within the last six months. Coby Briehn of the Temple Police Department, Temple, Texas says he and his team have utilized the TacView cameras in various ways. This police department purchased 3 TacView cameras. Detective Briehn states, "We can use the camera to observe a hallway while securing a room, such as in a static situation while the rescue team is moving victims to a secured room. Also, the camera can be mounted on a shield, with either a vice clamp or the "shield mount" device that TacView provides. This lets me clear a room by using the shield and letting who ever is behind me see what I see or maybe even see it before I can. I like the TacView because the monitor is detachable from the pole system and can be turned to show the proper layout instead of trying to rotate the camera to show the room. It works great in low and no light situations. Having 3 cameras, the Temple Police Department has a unique situation in that they can use the cameras to monitor several rooms at a time without ever entering the rooms. Someone at "the command post or a team member can watch the monitor from a safe (and hidden) location by clipping the camera to a window ledge, bush/shrub or a fence," says Detective Briehn. He adds, "We also have the small bore scope, and we can use that to look under doors." Detective Briehn has also been pleased with the TacView customer service. He states, "Every time I call TacView with a question or suggestion it has been taken care of promptly." The US Marshals Service, Southern District of Indiana, is the lead agency for the Fugitive Apprehension Strike Team which is a multi-jurisdictional warrant squad that operates in the Indianapolis metropolitan area. “We recently purchased a TACVIEW device to assist Task Force Officers during searches for wanted persons. We routinely arrest fugitives who hide in attics, crawl spaces, basements and other areas that are either hard to access or dangerous to search. Bomb squad searches apartment of James Eagan Holmes by inserting a TacView® pole camera through the 3rd story window of apartment complex from the platform of a fire truck.